Dry roast the moong dhal for few minutes ( hot when touched ) and soak them in cold water. Dry roast the sooji in the same pan until it's pale golden colour. Pressure cook the moong dhal using enough water for a whistle or two. Heat the ghee and oil in a pan and fry the cashews until it turns golden. Transfer the cashews to a plate and proceed frying the ginger ,curry leaves.Drop in the crushed pepper and the cumin seeds and fry. Add 4 cups of water,salt to this seasoning and let it boil. Add the roasted rava slowly to the boiling water and start stirring. Add the cooked moong dhal mixture as well. Combine well and make sure there are no lumps . 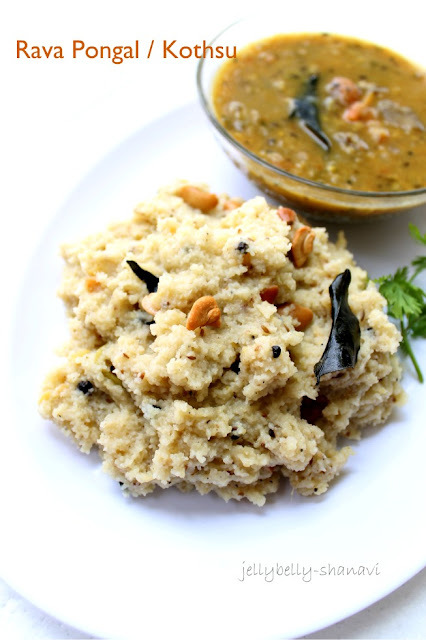 Add the roasted cashews and mix well.Cook until completely cooked and serve with kothsu.. Personally I would mix the cooked moong dhal with the water, then boil , later add the rava slowly to ensure no lumps, This makes the job really easy. 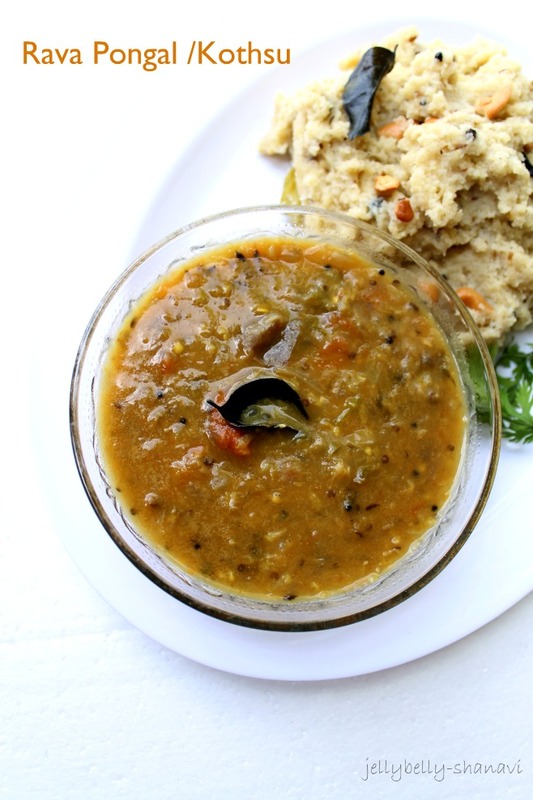 Heat the pressure cooker with oil and do the seasoning with mustard seeds and curry leaves. Then add the onions and scald well for a minute. Then dump in all the ingredients except tamarind paste and add a cup of water or so. Mix well and cook for 2 whistles. Open the cooker once the pressure drops and add the tamarind paste, and let it boil for a minute. Serve along with ven pongal /tiffin items..
U may also dump altogether except the seasoning ingredients and cook for 2 whistles and then do the seasoning at last. //Dry roast the sooji for few minutes and soak them in cold water. Dry roast the sooji in the same pan until it's pale golden colour. // cant understand....i think moongdal is dry roasted & soak in water,am i correct?? mouth watering yum!! !Agree with Menaga - perfect combo! 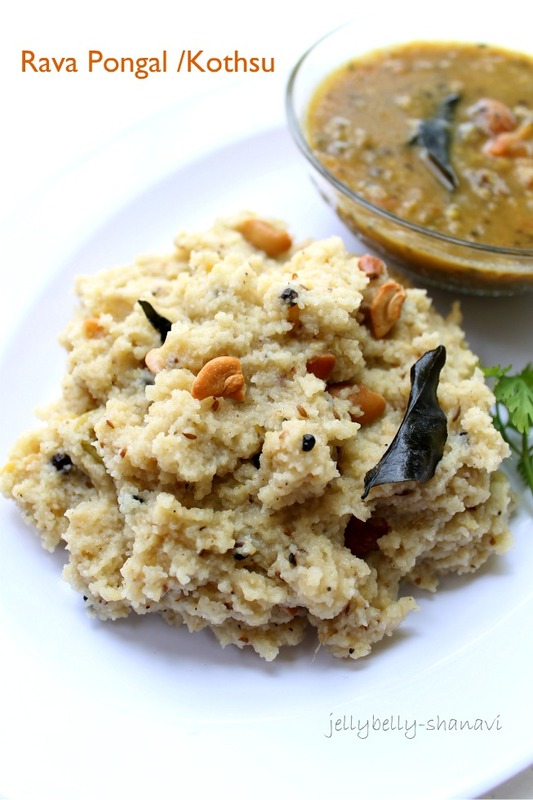 Pongal and Gostu .. made for each other. Looks yummy. Love the combo anytime, urs look perfect. Lovely combination,sounds so delicious and mouthwatering pictures. Looks very delicious!! Should try it some time! Wow ~ that sounds like an awesome meal n combo ~ Such tempting pics, beautiful! love it fav one n the combination..
My most favorite combo! Love your pictures! Makes me feel so hungry even now just after finishing the lunch!